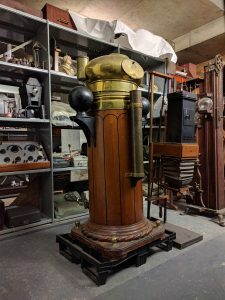 This blog post by Janine Fox, from the Museum’s Move Project Team, looks at one of the more unexpected items in our collections. Gathering and keeping shells from the beach is something many of us might remember from our holidays. But how many of us have turned these keepsakes into a personal and educational collection – classifying, mounting, cataloguing and displaying them? In store we discovered a cabinet of shells (Inv. 12714) containing a collection belonging to Robert T. Gunther, the first Curator of the Museum of the History of Science. 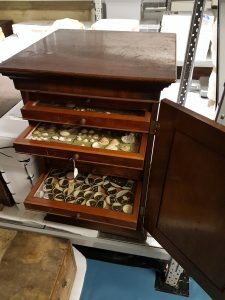 The cabinet contains sixteen drawers filled with sea shells and specimens collected along the coast, totalling over 1500 items. Many of the shells have been mounted onto boards labelled with the locations they were collected. Places include Posillipo, Woolacombe and Tenby. In the drawers were also examples of bones and fossils found along the coast and reference books for identifying the shells along with some documents relating to the Gunther family. The cabinet is now packed and ready for the store move. This has been an epic task taking four days to complete. We first cleaned and photographed the cabinet and each drawer as we found them in store. Some of the shells were loose as the old glue had failed and many items were grouped together. 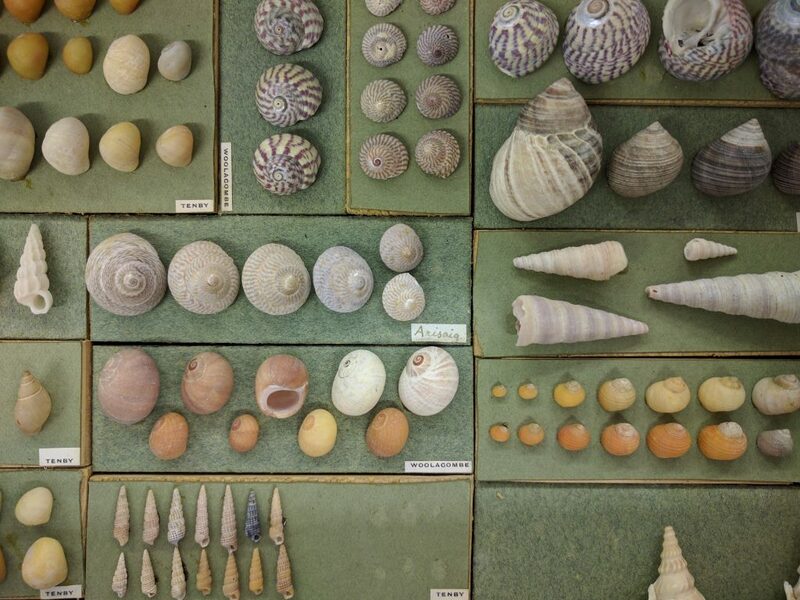 A photographic record means that the Museum can put back the shells in the exact same locations in the future should they wish. Annie and I packed the contents of each drawer into its own acid free box. The shells are lightweight so we used wire stitched card boxes. 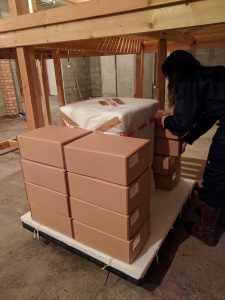 The boxes were lined with bubble wrap, which will help absorb shock and then acid free tissue paper so that the items are buffered with conservation grade material. A mixture of methods were used to contain and protect the shells within each box. 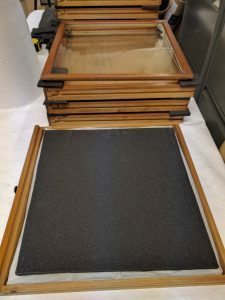 To prepare the drawers we lined each with bubble wrap pads covered in acid free tissue paper and a layer of plastazote (a type of inert foam) underneath the glass, again to help with absorbing vibrations. 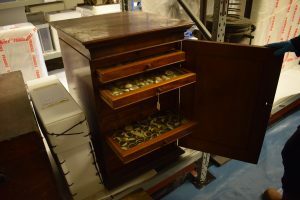 The drawers were inserted back into the cabinet; those which had some movement were secured with card and a pad was placed in-between the door and the drawers to cushion any movement from the front. The door was secured closed with cotton. 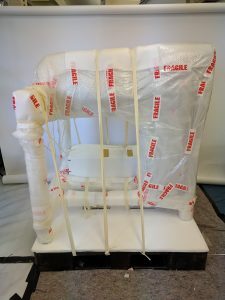 The cabinet was placed on a pallet topped with a conservation grade corrugated plastic and plastazote and then soft wrapped with acid free tissue. All the packed parts were labelled and with the object inventory number and weight. The pallet was moved to a temporary store room with our pallet truck, where it will stay until the big move. 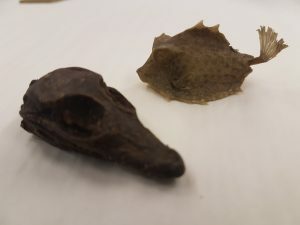 The Museum is undertaking a large project to pack and move its reserve collection. We will continue to post updates of the MHS Move Project on Inside MHS. Follow us to see what we get up to. You can also find us on Instagram and Twitter using #mhsmoveteam and #mhsstores. One small section of the Museum’s store. Our (off-site) collections are on the move. 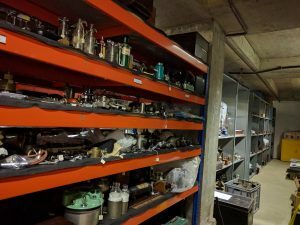 This guest post by Janine Fox, one of the Museum’s Move Project Team, introduces their exciting project and work. 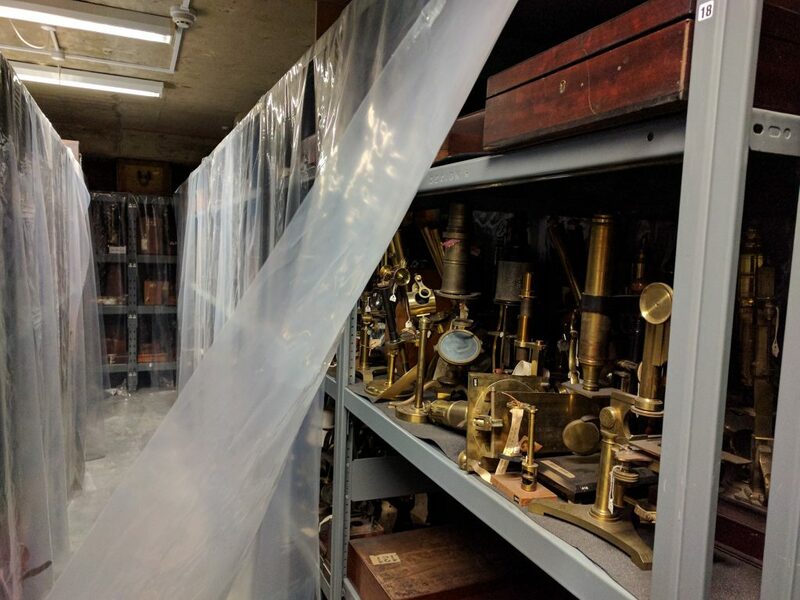 The Museum of the History of Science is embarking on a huge project to move the reserve collections to a new storage location. On display visitors can see Einstein’s blackboard, George III’s silver microscope, Lewis Carroll’s photography kit and Elizabeth I’s astrolabe. However, off display, the Museum has a large collection in storage, which at present, is receiving a lot of attention in preparation for an epic journey. As one of the Move Assistants on the project, I am super excited to start sharing my store experiences with you. I shall also be writing about the objects we find in store and how we pack them! In May 2016, MHS commenced a project to clean, audit, pack and move upwards of 35,000 items that are currently kept offsite. The collection must be ready to go by December 2017, when it will be moved to a new store in the sub-basement of the Radcliffe Science Library. This new location will be shared with partner University of Oxford Museums: the Ashmolean, the Pitt Rivers Museum and the Museum of Natural History. This move provides a fantastic opportunity for the Museum to improve documentation and stored conditions in-line with current standards. It will be the first time in many years that some items will handled, it’s fascinating and satisfying being able to give each object a moment of glory and attention. The collection will be audited before being packed. The audit allows the team to identify any hazardous material, measure, weigh and photograph each object and its parts. 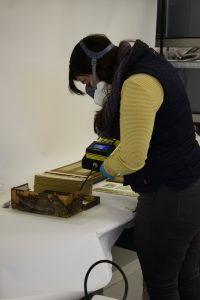 The collection will be cleaned using conservation equipment, which helps the team to check the condition and helps protect the objects from dust and pest damage. 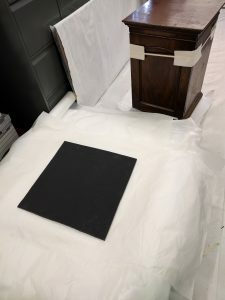 The objects will then be packed using conservation grade materials to protect them on their journey. Barcodes will be used to track each object and update new locations efficiently. The majority of the collection will be unboxed and placed on new open shelf storage. This project will improve the overall condition, documentation and accessibility of the Museum’s stored collections. The collection is broad and varies in size and weight. 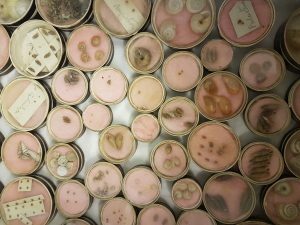 The stored collection ranges from tiny sea shells, microscopic specimens and archive material to paintings, laboratory equipment and astronomical telescopes. 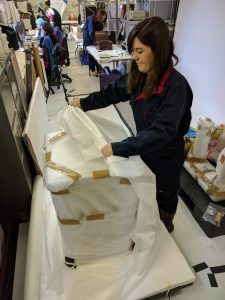 The variety of the collection provides a challenge for the move team; some objects are easy to handle and well documented, these take little time to prepare. Other objects are complex in terms of fragility, size, or have many parts, these can take many days to prepare. Above is an image of a shell cabinet from the Gunther Collection, which myself and Annie, Project Assistant, packed. This is one ‘object’, with 17 ‘parts’ (cabinet and drawers) and over 1500 ‘items’ (shells), which have needed to be individually handled and packed. This object has taken four days to prepare for movement – a detailed case study on how we did this will be posted soon! The move team is trained to identify, handle and pack items that contain hazards such as asbestos, mercury, lead and objects that can be radioactive. In addition, some items may have been treated with preservatives in the past, which we now know to be poisonous. Health and safety guidance for the handling and moving of such material has been prepared and circulated. The team also has access to a radiation monitor, mercury monitor and regularly wear personal protective equipment such as respiratory masks and overalls. First appointed to the MHS Move Team in March was Lucy Hadley as Team Leader. Then Project Assistants Annie McCulloch and myself, Janine Fox, joined the project. The three team members prepared the stores to be an everyday work environment; cleaning, ordering equipment, setting up welfare facilities, planning and auditing. In September/October, a further two Project Assistants, Martin Hasted and Rose Leithall, were recruited. The team is now in full swing with the cleaning and packing. We all have a wide range of experience in preventive conservation, documentation, curatorship and operations management. 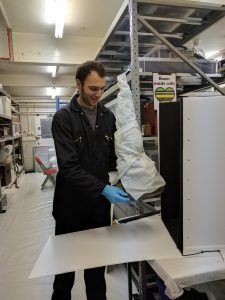 Team members have worked in organisations including the National Trust, The Science Museum, and local authority, university, and independently run Museums and Art Galleries. 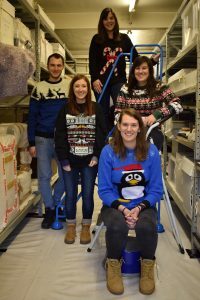 MHS are recruiting two more Project Assistants and also have a team of volunteers who will all be essential in making sure the collection is packed by the deadline. Once the team is complete, we will post a blog introducing everyone, in the meantime, here is a picture of our current move team in their Christmas jumpers – providing much needed additional warmth under the overalls in December! We will continue to post updates of the MHS Move Project on Inside MHS. Follow us to see what we get up to. You can also find us on Instagram and Twitter using #mhsmoveteam and #mhsstores.